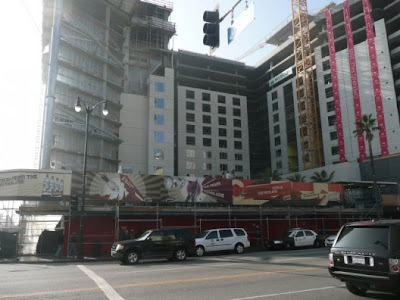 L.A., etc...: W HOLLYWOOD Hotel & Residences! Listed by our apartment therapy enthusiasts, many people aspire to have their bedrooms feel like a hotel room, (at least the bed!) Well now, if you happen to have the right amount of moola$, you can own one! 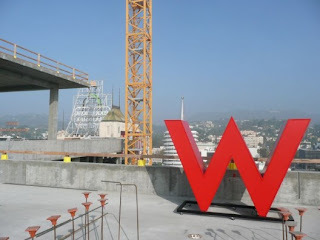 The W hotel chain (my fav, by the way) have recently launched their W Hollywood Hotel & Residences website. You can currently submit your information to be the first to own. It will be their 5th hotel/residence property, and will be located at Hollywood & Vine, with approximately 305 rooms and 143 condo/residences. If you own one of these condos, you'll have access to the hotels facilities, including room-service, housekeeping, and concierge services. Oooh la la. Covered by Curbed Los Angeles, the W Hollywood Hotel & Residences celebrated the completion of vertical construction with a topping out ceremony, an event that brought out politicians including Mayor Antonio Villaraigosa and City Councilman Eric Garcetti, both of whom mentioned the transportation element (it's above the Red Line) to this mega-development at Hollywood and Vine. I assume Hollywood was getting nervous with lots of traffic heading downtown....hmmm. It is very helpful artical.visit http://www.hollywoodtrump.com/ for more details aboutW hollywood residences.